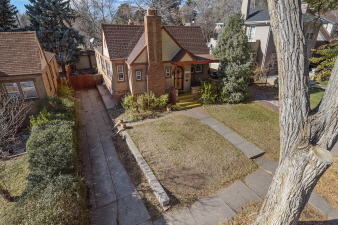 Awesome home 8 blocks from City Park. Walk everywhere - restaurants, ice cream, shopping. This super cool bungalow has tons of curb appeal and great interior character. Very hard to find with 3 bedrooms all on the main plus 1 more guestroom/office with its own dedicated bath on the lower level. Quaint entry with cozy fire welcomes you home. Formal Dining. Nicely updated kitchen boasts 42" cabinets w/ crown molding, stainless appliance suite, granite counters, and dedicated eating space. Eating space includes customized table and bench set fitting perfectly. Lower level is spacious and open. Huge great space includes pool table. Lots of storage and laundry room. This home was built for entertaining on those summer nights - generous oversized deck and nice yard. Long driveway with detached 2 car garage. Feeds into highly sought after McAuliffe International. Top tier high impact shingles on roof. Solar assumable - Save $$$ + Planet. Hurry before this one is gone! Buyer to verify all.